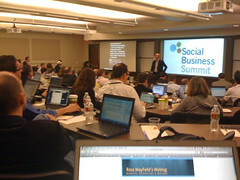 I'm in Austin where we just announced a partnership with the Dachis Group at their Social Business Summit. Lee Bryant is talking about how to build more efficient and effective organizations. What follows is an impressionistic transcript. I'm somewhat of a traditionalists. The 21st century corporation was an interesting experiment, but we have 100s of years of people-based businesses to drawn upon. The Hanseatic League was a tremendous ecosystem predicated upon a shared involvement, a value exchange mechanism, where people did right because they would meet again. The corporation that emerged was taylorists and specialized. It brought us scale. Great, don't want to downplay the benefits of it. But we can do things differently. Bureaucracy an business friction 1.0 is when structures that dampen network effects to get worse the more people use them. But now we have network effects and collective intelligence. Structures that harness network effects to get better the more people use them. We can have intimacy at scale. The old way to think about efficiency should be questioned. Anything value added more than a MacDonald's job needs to be. What used to be "me" is now "we" said John Chambers. The meeting culture is broken and process-driven control is very expensive to police. Trust is cheaper than control. Think about behavior, incentives and the way these play out in social networks. People are lazy, self centered and if they don't get something back they wont play ball. Are current organizational structures encourage or suppressing talents. We are starting to understand how people work collectively in networks. William Foote Whyte studied the social structures of an Italian slum, and found the bowling scores mapped to social hierarchy. If you happen to be smarter than the middle manager, that is not always a good thing, it could work against you. In social networks, positive behaviors (and negative) can be highly contagious. Obesity is contagious. Happiness is too. Pay it forward works even in three degrees of separation. Make performance drive through structures. Leadership as network influence; synthesizing, making links and making sense. Influence, passion and a good leader can subvert the structures under them. Collaboration and collective action have never been easier or cheaper. This has profound implications for organizational design. Ridiculously easy group forming. The curious case of corporate IT is that it codifies and gives longevity to bad structures. Create an operational framework with foundation services plus specific vertical applications. Making these capabilities available will let users tell you how they should be used. Build situated tools for specific needs and use cases. "As far as the customer is concerned, the interface is the product" said Jeff Raskin. Start by supporting existing behaviors with better, networked tools and features. Take advantage of Crackberry addiction. Measure, monitor and use open data to create positive feedback loops. Don't fall into the ROI trap and measure the wrong things just to get the seal of approval. What's the return on attention, not return on the cost of the system. Today Socialtext launched Socialtext 4.0. Core to this release is Collaborative Groups. Groups, and the ease in which they are formed, are not new to Socialtext, as we were the first to adapt wikis into the now common workspace construct. But the way in which this new capability is implemented tickles my inner social software geek. Back around the time in which social software was defined and when we started enterprise social software, Seb Paquet introduced the notion of Ridiculously Easy Group-Forming. Weblogs have a potential for group-forming like no other medium. However I'm convinced that much of it to this day remains untapped. I'd like to explain an idea that I have been bouncing around for a while. It might well be a reformulation of what others have said previously. I believe that implementing this properly would give a nice boost to the blogosphere's social aggregation capability. 4.0 makes it ridiculously easy for anyone to form a group, assemble needed tools and set the right privacy. Groups and their activity streams are discoverable. However, if I was to further amend Reed's Law, it would include "...and manage the noise it generates." Take groups on Twitter. The strength of hashtags is easy group-forming and discovery. The weakness is noise in and around the hashtag. Lists are relatively hard to form and discover, but I bet that will improve. Lists have relatively less noise unless you subscribe to them, and are more noisy as people-centric constructs. Twitter doesn't have Groups, but when you have a large scale enterprise microblogging deployment, you decidedly need them. Groups need to be public, private or hidden. Simple affordances let you have people-centric groups (e.g. a workgroup) or topical (e.g. innovation). But the real strength is filtering microblogging and activity streams. And if you miss something in real time, be able to leverage rankings and search that delivers results in context. Thanks for letting me get my social software geek on.